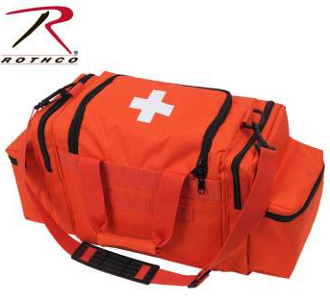 (1) Cloth Medical Tape 1"
The first aid suppliesare securely stored in a durable EMT Bag which measures 22" X 11"X 11 1/2", with one large main compartment (12” X 8” X 11”) that features a removable bag organizer. U-Shaped opening allows for fast and easy access, which is vital for accessing equipment in the field quickly. Trauma Bag also features adjustable shoulder straps and to carry handle.